Scaling the Great Wall at the Gubeikou section on a misty morning. 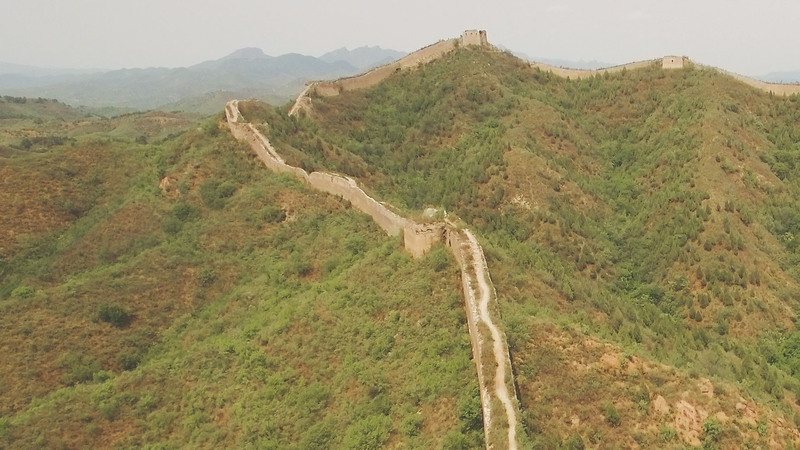 The first time I visited the Great Wall, I knew I wanted to do an audiovisual project there. I didn’t know what it was going to be about until I visited some wild sections of the mammoth monument. 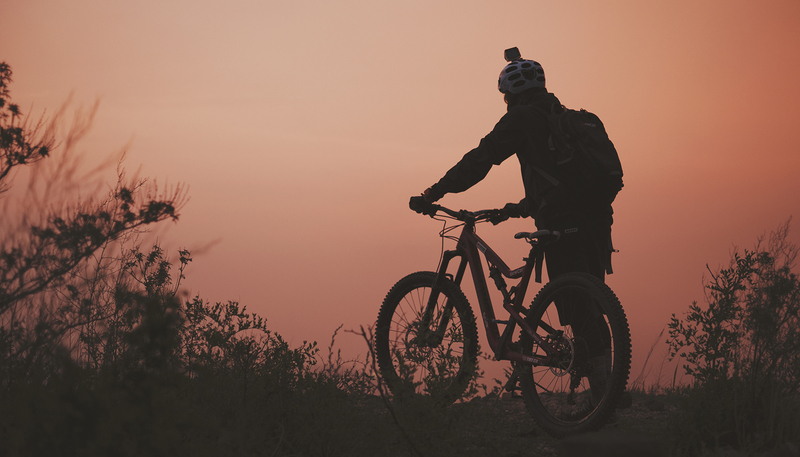 It was then when I pictured my friend and professional mountain biker, David Cachon, riding along its steep, narrow cornices and crossing its turrets. This thought came to me in 2014, soon after I first arrived in China. I told David about the idea of the video story I had in mind. He was up for the challenge straight away. 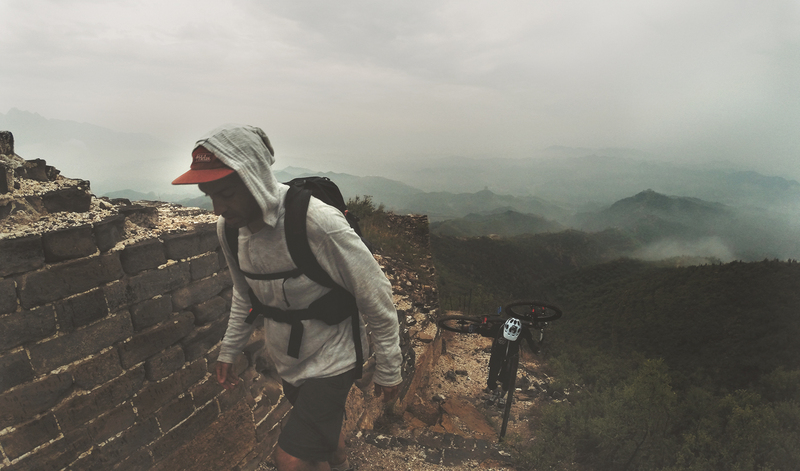 It’s likely that David isn’t the first mountain biker to tackle Great Wall. However, it’s safe to say that no one has ever ridden the Great Wall on two wheels quite like David. 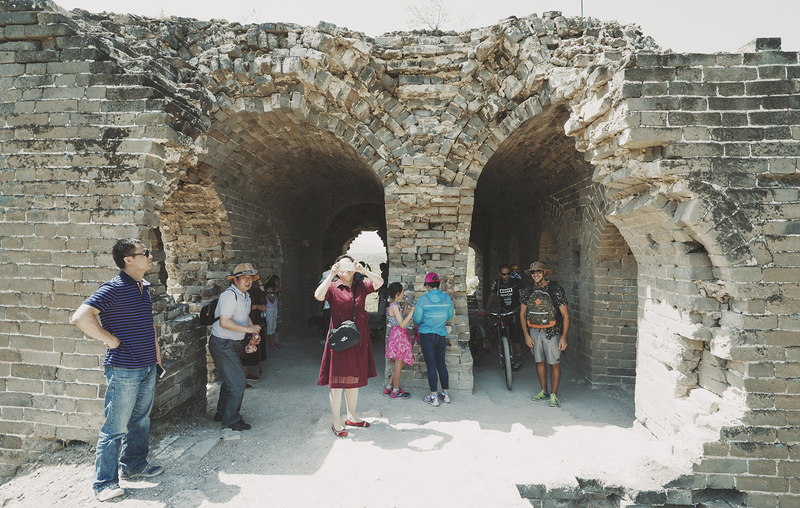 We were lucky enough to have good weather during the almost four days we spent in a village near the Great Wall. Late May is usually sweltering in Beijing, with random showers offering the only respite from the heat. Getting the best light for the shots was therefore crucial, thus we awoke at 3:00 to 4:00 am each day. We also had to make the most of light at dusk, which meant we were busy until 7:00 pm. These long days and early mornings made for minimal rest overnight. The magnificent sunrise glow from the east side of Gubeikou: an impressive reward after a early morning hike. Deciding what gear I would carry up the Wall along its trails wasn’t easy. I ended up carrying two backpacks: one for the drone and another for two Sony Alpha series cameras (plus their lenses). I fitted a Ronin M with the cameras and three lenses. While this might excessive, I knew I was going to use it all. The air blower became so handy to clean dust away from the gear as it was exposed to it all the time. China undergoes continuous, rapid changes. Streets get remodeled, buildings rise and fall, and regulations come and go. When I first hiked at Gubeikou, its untamed terrain meant only two or three other hikers would brave the wild section on any given weekend. This time around, we were asked to buy a ticket by a local walking along the Wall. There were also new paved trails coming from new parking areas with new stairs that take tourists conveniently to the midpoint of the Wall. With all these luxuries, the area was significantly more crowded. I therefore had to find other angles and places for the shooting. Local tourist access to the wild sections way easier now. David brought along Fernando Marmolejo, an experienced photographer with a stunning portfolio of sports shots, to capture the adventure in photos. He assisted me when filming with the drone, as the terrain was very dusty and landing the drone with the constant wind was challenging, especially when you are forced to land in manual mode. Upon turning on the drone, I was saw the dreaded message of “temporarily no-fly zone.” Fortunately, I had packed some aluminum foil that, when strategically placed, blocks the GPS signal and allows for takeoff. Although I don’t make this a practice, I was careful to assess the situation and ensure we didn’t interfere with anyone. I’m usually happy with the quality of the Phantom 3 camera. Its image quality isn’t always impressive, but the drone’s portability and ease of use compensates for its lack of image detail. Later, when I was checking video clips from the drone, I wished I had an Inspire 2 to shoot this video. Maybe for the next installment! David and Fernando checking up the last shot. In order to capture the ride in video and photo, we had shoot both when it was possible and alternate depending of the situation. We had to be flexible and make the most of every opportunity to take the best shots. Swipe to the left to reveal the raw footage and the tiny hikers on the crest of the wall. It was hard to coordinate the shot when there was nobody on sight. 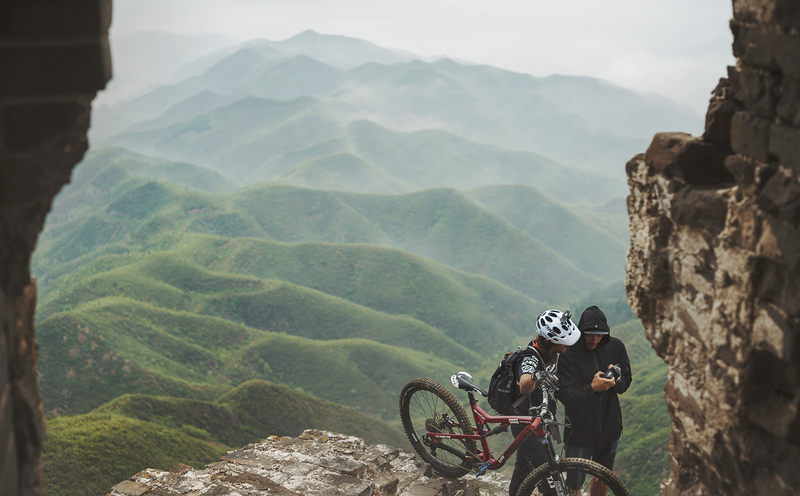 This is the opening shot of the biking part on the video, I had to remove the hikers on postproduction, it was easy as the background is uniform and they are pretty far out. I was very glad to see on the computer the images that I pictured in my head when thinking about the final video. Things don’t always go as planned, but with efficient planning you can control more. I envisioned the final product in a very detailed way, and I am glad the conditions were favorable. Even though we got some rain and unexpected amount of Great Wall visitors on some days, we mitigated these factors by planning ahead. Every “jornada” (working day) started at 4am (or even earlier, and ended up after sunset. Over the course of almost four full days, we went on long hikes on the wall, through steep sections carrying the equipment, water, food, the bike and other supplies. It was an epic team effort, and for sure it is one memorable experience on the Great Wall of China.